Winner winner, chicken dinner! 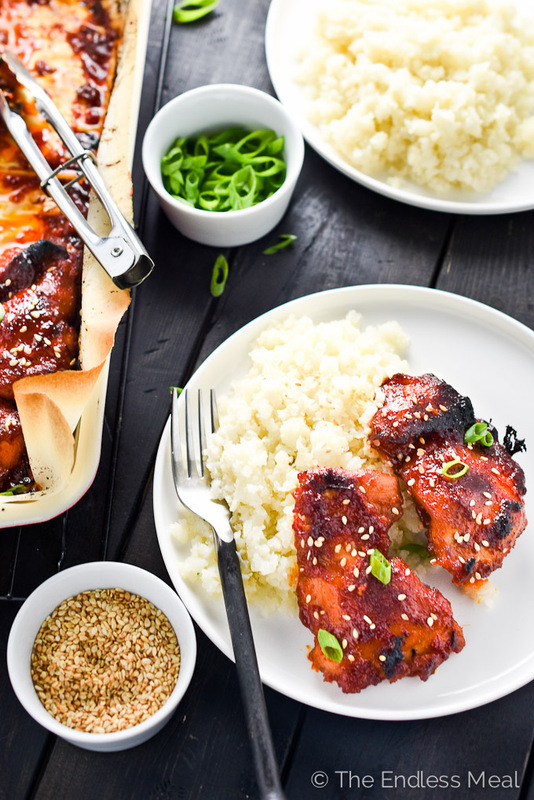 Do you see those sweet, juicy, Korean paleo chicken thighs right there? You want to make those. 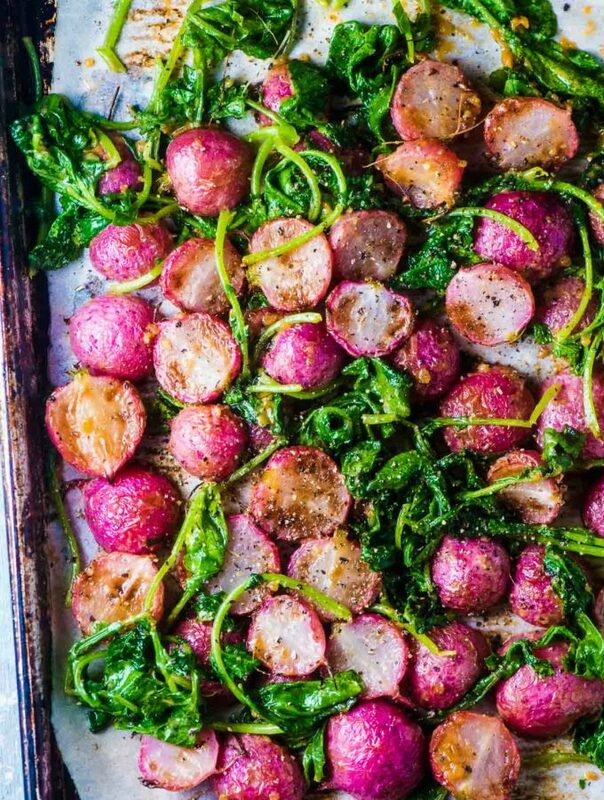 This recipe has become my go-to quick and easy weeknight dinner for the past few weeks. I've made this same recipe with chicken breast, drumstick, and chunks of chicken, but boneless thighs win. The thighs manage to stay juicy and tender long enough for the sauce to start to caramelize and turn extra sweet. I've made this Korean paleo chicken using a Korean chili paste called gochujang. Fermented chilis give it the most fantastic, slightly smoky flavor. It's also not nearly as hot as fermented chili paste might sound. I buy gochujang from a little market up the road; most well-stocked supermarkets should carry it as well as any Asian food store. I have to be honest; I only tried gochujang for the first time about a month ago. Since then I've become obsessed and am already on my second jar. 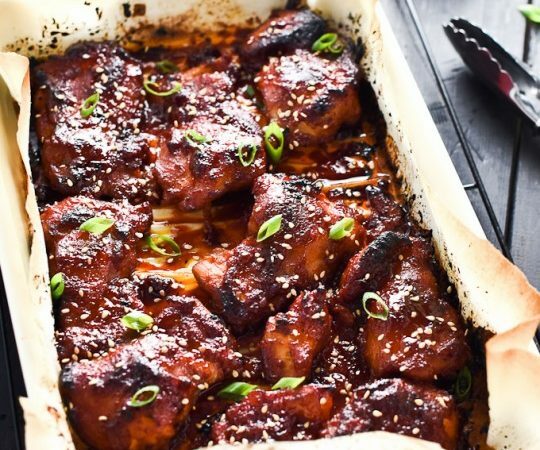 I polished off the first jar after making this Korean paleo chicken thighs recipe on repeat for two weeks straight. It's seriously that good. Update: Since sharing this recipe nearly two years ago, I've gone through 487 jars of gochujang. Ok, that might be a bit of an exaggeration. I have cooked with tons of gochujang since and made this recipe more times than I can count. Here's what you need to know about these paleo chicken thighs: they're super easy to make. Honestly, I no longer measure any of the ingredients. I eyeball everything and they always turn out. I supposed it helps that there are only six ingredients in the sauce. They always have that sweet/ spicy/ smoky winning flavor combo. Seriously, is there anything better in the world than that combination. It gets me every time! How do you guys feel about cauliflower rice? I first started making cauliflower rice bout six months ago, and I couldn't believe how much it is like the real thing. I mean, it's not EXACTLY like the real thing. If you were to ask my handsome man, he'd tell you it's not anything like real rice. But then, he loves rice. I've never been a huge fan of rice, so the subtle differences don't bother me at all. It reminds me of slightly overcooked rice that's missing the bite it normally has. Even if you don't eat a paleo diet, it's hard not to love how healthy it is for you. A cup of cauliflower has only 25 calories and is full of vitamin C, K, and folate along with tons of other good for you vitamins and minerals. Plus you get to cross off another serving of your daily veggies. Big time win. I normally count on 2 cups of uncooked cauliflower rice to be the perfect size for a dinner side. That's for one person (me!) since there's always a pot of basmati on for my guy. If you want, you can freeze uncooked riced cauliflower in individual portion sizes. I do this as it makes my life so much easier and I'm less likely to cave into convenience and eat regular rice. I have to warn you though, once you freeze cauliflower it becomes very cauliflower-y when you thaw it. And I don't mean in a good way. I don't mind it much, but if you're even a little on the fence about cauliflower rice, stick to making it fresh. Please promise me you'll make them. They have been such a hit with my family and I'd love for your family to fall in love with them, too. Normally, when I make them I serve them exactly as they are here. Sometimes I'll switch things up and make roast potatoes instead of the cauliflower rice. Once in a while, I'll make a big salad and serve the chicken sliced over top of the salad. 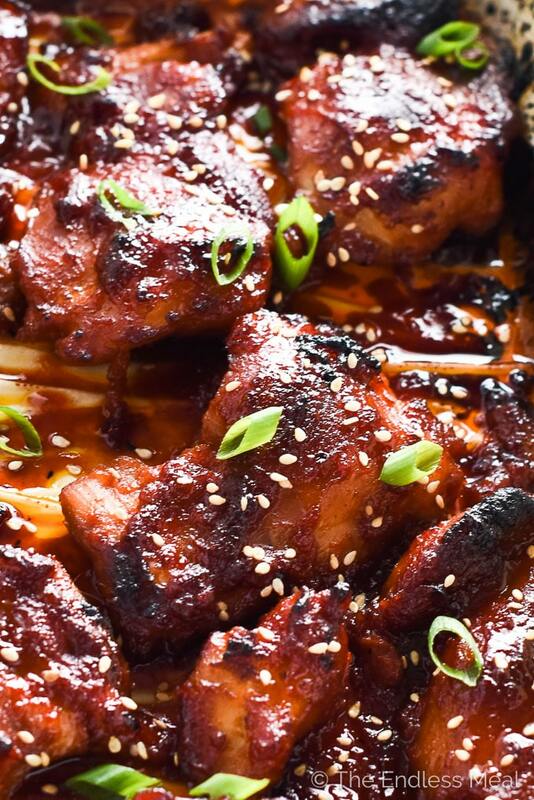 If you're looking for more delicious ways to use the rest of your jar of gochujang, try these recipes: Grilled Gochujang Pork Chops with Mint Watermelon Salad, Gochujang Pulled Pork Korean Pizza, or Crock Pot Korean Gochujang Pork. They are all amazing! Place the chicken thighs in a resealable plastic bag. Add the honey, gochujang, coco aminos, sesame oil, ginger, and garlic and seal the bag. Squish the bag around a little so that the marinade coats each piece of chicken. Let the chicken marinate for 1-24 hours in your fridge. Note: If you don't have time to marinate the chicken mix all the marinade ingredients then pour it over the chicken after you add it to the baking dish. Pour the chicken and all the marinade into the prepared baking dish and move the chicken around, so it is in a single layer. Bake in the oven for 25-30 minutes, turning a few times. The chicken will be cooked through at this time but to get a nice dark red chicken you can broil it at 425 degrees for another 10-15 minute, this is how I like it best. If you aren't able to control the temperature that your oven broils at, make sure to keep a close eye on it and reduce the cooking time so the sugar in the marinade doesn't burn. While the chicken is cooking, prepare the cauliflower rice. Working in batches pulse the cauliflower in your food processor until it resembles rice. If you don't have a food processor, you can grate or finely mince the cauliflower. Add the cauliflower rice to a large frying pan over medium heat and add 1/4 cup of water. Cover the pot and let the cauliflower steam for 6-8 minutes, or until it is soft. Remove the cauliflower from the heat and season to taste with sea salt. The ingredients in gochujang can vary by brand; many at the store I shop at don't even have the ingredients listed in English! If eating a 100% paleo diet is important to you make sure you check the ingredient list or try making your own. This is actually really freakin good! I didn’t bake it but did mix everything together and used my sous vide. After it was cooked I broiled it skin side up and it turned out amazing! What a great idea to use your sous vide!! This was wonderful and pretty easy to make! I did have a LOT of liquid, and the sauce didn’t stay thick when cooking because of this. I suspect it was just the water from the thighs, so there was a lot of juice leftover once everything was cooked. But it was great, and I would cook it again for sure. My girlfriend and her sister loved it as well. That can happen sometimes with chicken. To thicken the sauce quickly, you can pour it into a pan and boil it rapidly for a minute or two until the extra water evaporates. Happy to hear the recipe was still a hit! Most of the sauce was gone after baking, is this supposed to happen? I would like more sauce when I eat it. Made this tonight! SO delicious!! The entire family loved it, which is a feat. 😉 . This will absolutely become a regular in our home. That’s so great to hear! Hooray! Thank you for this recipe! I live in Alabama and was not able to find gochujang so I picked up a bottle of Hoisen instead. I am not sure that this is a good substitute as I don’t really know a lot about cooking but we love the taste so I am sticking with it. 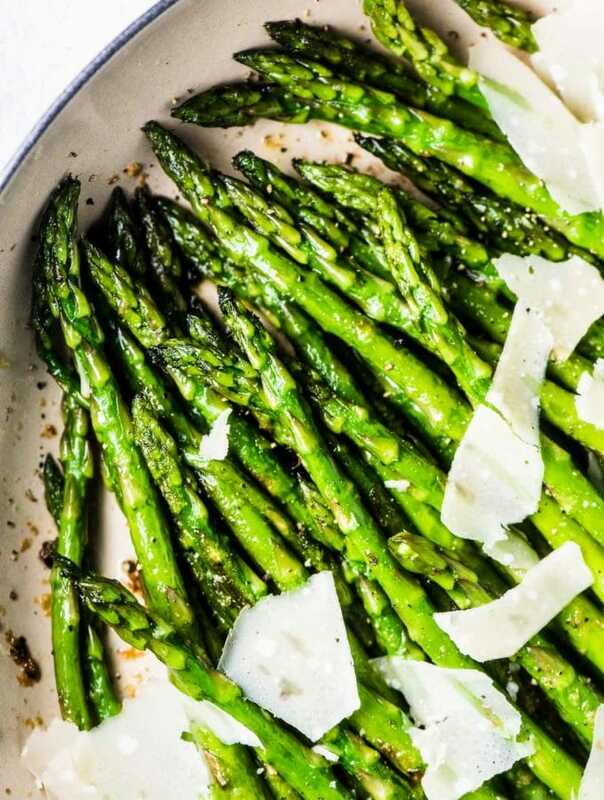 We make this dish almost once a week or when my husband doesn’t feel like cooking. Thanks for sharing your amazing recipes! I want to make this, but we have a severe soy allergy in our family and all brands of gochutang contain soy. Can you recommend a replacement ingredient (soy free) for the gochutang? Made this with my sister last week and we haven’t been able to stop talking about how delicious it was! I didn’t have gochujang, but used chili garlic sauce. OMG it was sooooooo tasty! I want to try it with the gochujang though because the sauce didn’t get very thick like the picture looks. We wrote the recipe down and have it in our cook book! Thank you for this delicious recipe! First time I made it I was unsure now my husband begs for this chicken!!! I’m making it with pork chops tonight instead of chicken I hope it works! That’s awesome! I’d love to hear how it turned out with pork chops. That’s a great idea! HOLY GOCHUJANG! I’ve been looking at this recipe for about a week while I gathered the stuff needed and wow was it good! I was skeptical because my only experience with Korean food was the smell coming from the neighbors house which I understood to be coming from the jar she sometimes kept outside, I later learned that was Kimchi, still haven’t braved myself to try that. I cooked the boneless thighs on a raised wrack and it was amazing. I can’t wait to cover everything in this Gochujang, going to try the same sauce for tofu for my mom. Nice suttle spicyness and tang and the fresh ginger! Will be keeping this and looking at some of your other recipes! Ha ha omg I love it! You totally made my day. And be brave and try kimchi … it’s really good. Think spicy saurkraut. Yum! I don’t think i’ll be able to find gochujang where I live! 🙁 I’m an hour outside of the city. Do you have some ideas about what I could substitute for it? Siracha? Do you think it would be too spicy for my 6&8 year olds? I wouldn’t substitute Sriracha as it has quite a different flavor. Have you tried Amazon? That’s where I always turn when I can’t find something. So easy! Finally got around to trying this recipe and it is outstanding..When my small pack of gochujang is empty I will definitely try to make my own…which by the way ….not in the to far distant future. Gochujang contains a lot of corn syrup, rice syrup, fructose or glucose. Not sure if that fits into a Paleo diet or not. Would this work on a bbq? In a tinfoil pan maybe? It’s way too hot for the oven these days, isn’t it?! I haven’t tried it on the BBQ yet, but it’s definitely worth a try. I know it’s a little late, but I just found you! This recipe sounds freaking fantastic! Can I make this with bone-in chicken thighs? I already have them. Will I need to increase the cooking time? I made them with the chicken thighs… OMG… they were delicious! My son loved them! But, they didn’t get sticky… the sauce remained liquidy. I may have used a little extra soy sauce by accident, and it got all bubbly while cooking. The skin crisped up nicely too. It was still delicious enough for him to say, “Mom, can I drink the rest of this?” But I still wonder why it didn’t thicken up and get sticky like you describe.. It was definitely a hit, and I will be making it again, but perhaps you can figure out what happened? How strange that it didn’t thicken! Did the chicken fit quite tight in the pan you used? The smaller the pan the longer it would take for the marinade to reduce. Perhaps this is what happened? So happy to hear that the recipe was a hit! I had the same thing happen almost to the letter. We did bone in chicken thighs (we had to double the cooking time for bone-in), and my husband was CRAZY about the sauce… As in licking MY plate clean. I must confess, I snuck into the kitchen after dinner was over and spooned some over the leftover cauliflower rice. It was that good! My guess is that because the bone in thighs have the skin on, the extra fat keeps the sauce from thickening. There was a thick layer of oil on top when I pulled it out of the refrigerator this morning. I personally don’t care, this is still one of the best low-guilt chicken dishes I have had. Thank you SO much for posting this recipe! That’s it! I make these with boneless, skinless thighs but … I bet all that extra fat was extra delicious! This recipe is so freakin good!!! Since finding it my husband asks for it weekly. Even my picky 6 year old that usually wouldn’t touch a piece of chicken loves it. Thank you so much for sharing! Yum this looks so good! Instead of marinating the chicken could I put everything in the crock pot? If so how long do you think I should cook it and at what temp? Thx! I haven’t made this in a crock pot before so I can’t say for sure. I’m sure you could use the recipe flavours as a guide and go from there. You will want to add some liquid or it might burn. I would try it on low for 4 hours and go from there. Happy experimenting! Thanks for your recipe. I love Korean food. Just a heads up though, most gochujang contains grain, usually wheat. Making a ‘porridge’ to add to gochujang, kimchi, etc. is a traditional way of making Korean ferments. It’s a delicious food but not Paleo due to the grain in it. Most gochujang also contains sugar that isn’t Paleo friendly in the ingredients. If you’re up for it, I’d love for you to let us know how to make a Paleo gochujang or if there’s a brand of it that would be best to purchase? You’re right, most gochujang does contain wheat. I know that many people who eat paleo are ok with small amounts of non-paleo condiments in their diets … so many contain wheat and sugar! Is the sauce similar to the of hotties lollipop wings, take me out restaurant? I’ve never heard of the restaurant Hotties before, so I really can’t say. Sorry I can’t be of more help! This recipe looks amazing! I’d like to try it with chicken drumsticks..do you think that the cooking time would change? Drumsticks and thighs cook at a pretty similar time so you shouldn’t have to adjust the time at all. Hope you like the recipe as much as I do! Just made this & it was outstanding! I want to make this right now…wish I had the ingredients …happy feasting! I hope you’re able to get the ingredients soon!! There are few things I love more than finding a recipe I want to make and realizing I don’t have to run to the store for a single ingredient. Win! I hope you love them as much as I do!! WOW. This chicken is STUNNING! I love how sticky it looks! Thanks, Nicole! It really is delicious!! I have been on a gochujang kick ever since my friend from Korea introduced me to it – I’m totally obsessed! I seriously want to put it on EVERYTHING! 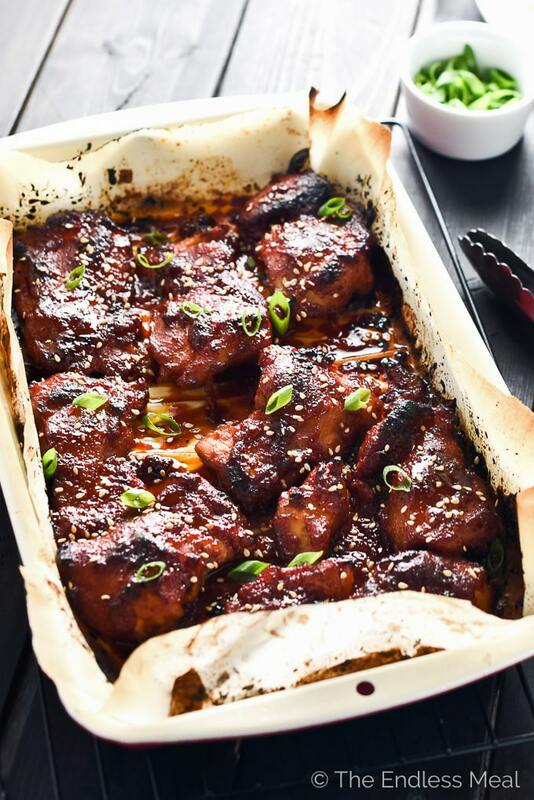 These chicken thighs look phenomenal – just get a look at that incredible glaze! Gotta give that cauliflower rice a try too! Me too! What do you use it on? I’m thinking some sort of breakfast/ egg dish would be amazeballs. You totally should try cauliflower rice. I love it! I totally agree! Sweet and salty is always the best!! I always enjoy using gochujang — it has such an interesting flavor, don’t you think? And it’s perfect in this recipe! This looks so good. And I’m a big fan of chicken thighs — love their flavor. This is super — thanks. I totally agree! Since finding out about it I’ve become completely obsessed. I don’t know how I lived without it for so long! 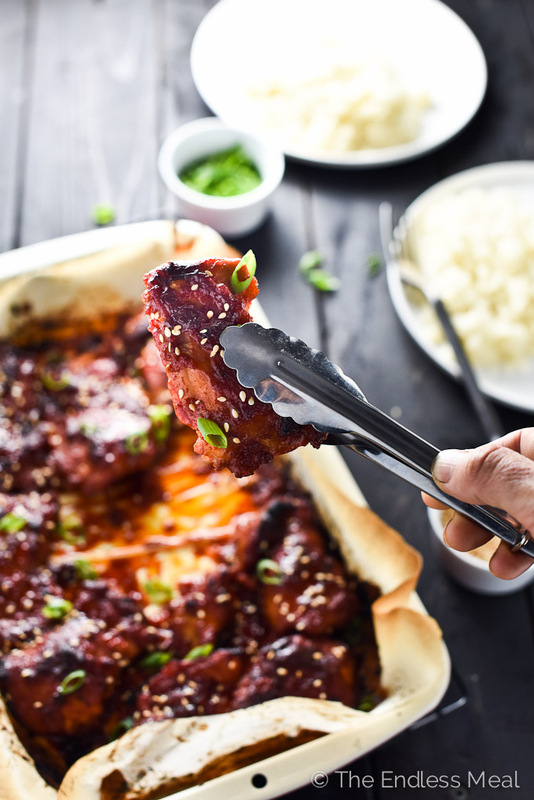 What’s your favourite way to use gochujang? This chicken looks sticky and incredible! It has such great color. Pinning. Thank you for the pin, Thao! 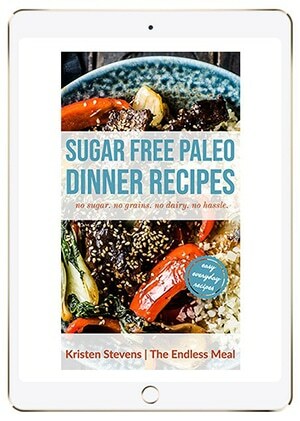 What a beautiful recipe, Kristen! You’re absolutely right. It’s a winner. You’re winner. And only I’m a looser since I don’t have this delicious chicken:) Great job! Tell you what, I’ll share, then we can both win! Great minds think alike. I recently posted a Chicken Thighs recipe. They are fantastics, super tender and I think better than chicken breasts! Great minds do think alike! I’m so loving the look of your Asian chicken thighs. Yum!! I can never find good looking chicken thighs at the grocery! But omg…can you please invite me over for dinner!!? Ha ha yes absolutely! You are invited over anytime!! Dam girl! You just made me really really hungry! Thanks… I’m going to have to go my myself some gochujang and chicken thighs! You totally should! It’s crazy how obsessed I’ve become with it!! Looksgood but i dont think sesame oil is paleo. Seeds yes oil no. I’ve read a bit about sesame oil and, from what I can gather, using it in small amounts is ok. Since it’s only ever used for flavoring (and not as a cooking oil) I think most recipes fall into the ‘using it sparingly’ category.